There’s just no place like a hospital for finding life and death struggle. A cliché, certainly, but one that serves an excellent purpose in the world of mystery. Why do I choose to write mysteries set in medicine? Actually, there are several very good reasons, from the intellectual to the perfectly selfish. The first and foremost of these is, of course, that life and death business. A hospital isn’t just a convenient setting. It’s an automatic notification to my audience that desperate things can happen here. The stakes have already been set, the playing field is familiar. Everybody who has read Frankenstein knows that doctors hold the power of life and death and, sometimes, rebirth in their hands. Every television show from Dr. Kildare to ER reinforces the concept that in medicine split-second decisions make the difference between life and death—and that not only very good people, but very scary people can be making these decisions. By setting a book in the world of medicine, I have already let my audience know that no matter how much humor is involved, the consequences of what happens here will not be frivolous. The second reason I use medicine is one people might not really consider. Not only is medicine a natural place for mysteries to occur, but medical personnel make natural detectives. It is, after all, what we are trained and paid to do. What is disease, after all, but a mystery? We are presented with a patient who exhibits a certain set of symptoms and complaints, and it is up to us, the detective team with its laboratory findings and hunches and deductive reasoning to find out what the culprit is and contain it. We correct an imbalance in the system, which is exactly what the best detectives do in good fiction. Therefore, the impulse to extend the doctor’s or nurse’s interest and talent in detecting beyond the realm of medicine is a natural one. It is in his or her very nature to solve mysteries. The third reason is what I call the Marathon Man factor. In this wonderful movie, the villain is a dentist, which means, of course, that he uses his dental tools for torture. When I saw the movie the first time, I lasted as long as it took him to open up those gleaming, nasty little instruments. I listened to the rest of it from the lobby—with about half the audience. William Goldman, who wrote book and screenplay, didn’t have to explain a thing to terrify his audience. He knew he had them the minute that case was opened. The same principle holds true for medicine. Any sensible person is simply afraid of hospitals. As much as we want to trust hospital personnel, we’re really terrified of them. After all, we are at their mercy in a foreign world where people speak a foreign language and hold our lives, our dignity, our sense of self in their sometimes callous hands. Add to that automatic dread the thought that while we are in that place, at our most vulnerable, we find out a murderer is set loose among us. As an author I feel absolutely no compunction about using this natural fear to notch up the tension in a book without ever having to print a word. An example from my own work is my HarperCollins paperback A Man to Die For. Using William Goldman’s dentist as my inspiration, I instead made my villain a psychopathic, serial-killing gynecologist. See? Any women out there reading those words doesn’t even have the crack the cover of the book to fear this guy. Now to the selfish particulars. It’s easy. I know medicine. Because I was not only raised in a medical household but spent some twenty years working trauma centers, I know the world of a hospital as well as Wambaugh knows police stations. I know the lingo, the priorities, the secrets, the terrible truths nobody tells the public. I loved the people I worked with, the job I did, the world I inhabited. Since one of the reasons we read books is to learn about a world we’re not familiar with, I take great delight in sharing my world with my audience. I also write from a rather unique perspective. 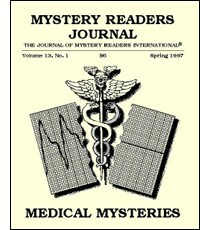 Most traditional medical mysteries are written from a doctor’s viewpoint. Let’s face it. Most of popular media focuses on the doctor’s viewpoint. But if you want to know about how a hospital really works, a doctor is usually the last person to ask. Better yet, ask a nurse. Because a nurse deals with every level of the hospital hierarchy, and knows better than most how very scary hospitals really are. The other wonderful thing about writing in the medical field is that I never run out of ideas. The field is fluid and dynamic. The problems are ever-present and as cutting edge as next week’s news. And, to be perfectly frank, I get the satisfaction of killing off all the people who contributed to my burn-out. In A Man to Die For I killed off doctors, in Nothing Personal hospital administrators, and in Bad Medicine lawyers. I do step afield in my next book for HarperCollins, Brain Dead, and fulfill a special request from my sister to kill off ex-husbands. But I still lay bare the workings of a hospital where a new Alzheimer’s unit may be the very thing to save the hospital, a marginally surviving town, and all the patients in this revolutionary research facility. That is, if the facility isn’t killing more than its patients in the meantime. It is up to the intrepid forensic nurse, of course, to find out—at great peril to herself. And what’s a forensic nurse, you ask? Well, that’s what I mean about medicine being fluid. Forensic nursing is one of the newest subspecialties available to nurses today. I happen to be the unofficial mascot for the International Association of Forensic Nurses, as a matter of fact. If you want to know more about what they do, read the book. You know you’ll find out something new about a world that, face it, makes you just a little nervous. Even without a murderer running around inside. Every week on Diagnosis Murder, Dr. Mark Sloan is able to unravel a puzzling murder by using clever deductions and good medicine to unmask the killer. What I do is tell stories. And what I don’t know, I usually make up… or call an expert to tell me. Writing mysteries is, by far, the hardest writing I’ve had to do in television. Writing a medical mystery is even harder. On most TV shows, you can just tell a good story. With mysteries, a good story isn’t enough, you also need a challenging puzzle. It’s twice as much work for the same money. We always begin developing an episode the same way—we come up with an “arena,” the world in which our story will take place. A UFO convention. Murder in a police precinct. A rivalry between mother and daughter for the love of a man. Once we have the arena, we talk about the characters. Who are the people the story will be about? What makes them interesting? What goals do they have, and how do they conflict with the other characters? And then we ask ourselves the big questions—who gets murdered, how is he or she killed, and why? How we solve that murder depends on whether we are writing an open or closed mystery. Whether the murder is “open,” meaning the audience knows whodunit from the start, or whether it is “closed,” meaning we find out who the killer is the same time that the hero does, is dictated by the series concept. Columbo mysteries are always open, Murder She Wrote was always closed, and Diagnosis Murder mixes both. An open mystery works when both the murderer, and the audience, think the perfect crime has been committed. The pleasure is watching the detective unravel the crime, and find the flaws you didn’t see. A closed mystery works when the murder seems impossible to solve, and the clues that are found don’t seem to point to any one person, but the hero sees the connection you don’t and unmasks the killer with it. In plotting the episode, the actual murder is the last thing we explore, once we’ve settled on the arena and devised some interesting characters. Once we figure out who to kill and how, then we start asking ourselves what the killer did wrong. We need a number of clues, some red-herrings that point to other suspects, and clues which point to our murderer. The hardest clue is the finish clue, or as well call it, the “Ah-ha!,” the little shred of evidence that allows the hero to solve the crime—but still leaves the audience in the dark. The finish clue is the hardest part of writing a Diagnosis Murder episode—because it has to be something obscure enough that it won’t make it obvious who the killer is to everybody, but definitive enough that the audience will be satisfied when we nail the murderer with it. A Diagnosis Murder episode is a manipulation of information, a game that’s played on the audience. Once you have the rigid frame of the puzzle, you have to hide the puzzle so the audience isn’t aware they are being manipulated. It’s less about concealment than it is about distraction. If you do it right, the audience is so caught up in the conflict and drama of the story, they aren’t aware that they are being constantly misdirected. The difficulty, the sheer, agonizing torture, of writing Diagnosis Murder is telling a good story while, at the same time, constructing a challenging puzzle. To me, the story is more important than the puzzle—the show should be driven by character conflict, not our need to reveal clues. The revelations should come naturally out of character, because people watch television to see interesting people in interesting situations… not to solve puzzles. A mystery, without the character and story, isn’t very entertaining. In my experience, the best “Ah-ha!” clues come from character, not from mere forensics—for instance, we discover Aunt Mildred is the murderer because she’s such a clean freak, and couldn’t resist doing the dishes after killing her nephew. But this is a series about a doctor who solves crimes. Medicine has to be as important as character-based clues. So we try to mix them together. The medical clue comes out of character. So how do we come up with that clever bit of medicine? First, we decide what function or purpose the medical clue has to serve, and how it is linked to our killer, then we make a call to an expert to help us find us the right malady, drug, or condition that fits our story needs. If one of our paid medical consultants doesn’t know the answer, we go to the source. If it’s an episode about infectious diseases, for instance, we might call the Centers for Disease Control. If it’s a forensic question, we might call the medical examiner. If it’s a drug question, we’ll call a pharmaceutical company. It all depends on the story. And more often than not, whoever we find is glad to answer our questions. For instance, in one episode there’s a terrible bus accident and the passengers are trapped inside. Once they are freed, paramedics discover one of the passengers is dead. What Dr. Mark Sloan discovers is that the accident didn’t kill the passenger… the man was murdered. The killer had to be one of the passengers, since they were all trapped inside after the accident. So someone killed the person in the five minutes after the accident and before the paramedics arrived and hoped the death would be blamed on the crash. We knew we needed a medical clue that Dr. Sloan could find that would reveal the man’s death was actually murder, not a result of the bus crash. So we called our medical consultant, Dr. Gus Silva, and gave him the details. He called some of his fellow doctors and got back to us an hour later with the forensic clues we needed. One of the paramedics in the episode is cocky, self-confident, and studying for med school entrance exams. Dr. Sloan, to help her out, gives her a pop quiz, asking her four questions. She gets one of them wrong, but Dr. Sloan won’t tell her which one because he wants her to figure it out for herself. We thought it would be clever if Dr. Sloan realizes she’s the killer because she made the same mistake committing the murder that she makes in his pop quiz… in other words, her mistake comes from the same cockiness and over-confidence she demonstrates in her zeal to become a doctor. We went ahead and plotted the story, but relied on Dr. Silva to get back to us with just the right, subtle medical mistake that would trip the paramedic up. The viewer enjoys the game as long as you play fair… as long as they feel they had the chance to solve the mystery, too. Even if they do solve it ahead of your detective, if it was a difficult and challenging mystery, they feel smart and don’t feel cheated. They are satisfied, even if they aren’t surprised. If Dr. Sloan catches the killer because of some arcane medical fact you’d have to be an expert to catch, then we’ve failed and you won’t watch the show again. To play fair, all the clues and discoveries have to be shared with the audience at the same time that the hero finds them. There’s nothing worse than withholding clues from the audience—and the sad thing is, most mysteries on television do it all the time. The writers do it because playing fair is much, much harder than cheating. If you have the hero get the vital information off screen, during a commercial, the story is a lot easier to plot and the writing staff can eat out for lunch instead of having pizza delivered again… and being stuck in a story conference for six more hours. But when a Diagnosis Murder episode works, when the mystery is tight, and the audience is fairly and honestly fooled, it makes all the hours of painful plotting worthwhile. That, and the residual check. Lee Goldberg is the author of My Gun Has Bullets and Beyond the Beyond (St. Martin’s Press), a comic thriller about TV, and is the supervising producer of Diagnosis Murder.